With the average human having the attention span of 8 seconds (just under that of a goldfish), why would present your visitors with lackluster visuals, distracting widgets, and hard-to-read typography? Don’t make them dig through your site like a markdown bin looking for your best work. Get a WordPress site that seamlessly complements your work, whether you’re a vlogger, blogger, photographer, author, entrepreneur, or journalist. 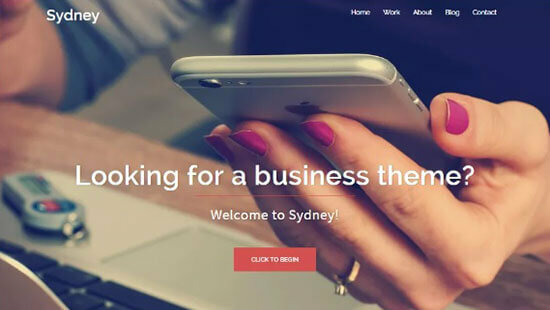 The following WordPress themes have been handpicked for you to be visually stunning, SEO optimized, mobile responsive, and worthy of your work. While most themes have basic customisation options, you are limited to the layout of the theme. What if you want to change that layout or customise even more? Maybe add more lead generation elements or something super creative? Elementor Pro’s theme builder feature allows you to customise your entire theme without learning how to code (or hiring a developer). Everything is drag & drop so you can create something truly unique. You know you get support, flexibility, and customization with a paid theme. And there will be fewer websites out there using the same theme which means your website will stand out more. If converting visitors into customers is your primary goal, Growtheme is your superhero theme. Beautifully designed and lightweight, this one-of-a-kind WordPress theme packs a punch when it comes to conversion features. It’s uniquely designed to leverage list building strategies that just can’t be done with other themes. Developed and supported by Jascha Brinkmann, Growtheme allows you to leverage high-converting list-building strategies without the need for multiple plugins and separate landing page products. Easily create feature boxes, sticky widgets, after-post opt-ins, author bylines opt-ins, sticky sidebar widgets, and more. You also get the ability to create consistent well-designed squeeze pages, welcome gates, and upside down homepages. Support is top notch and comes with everything you need to turn first-time visitors into customers, clients, and email subscribers. 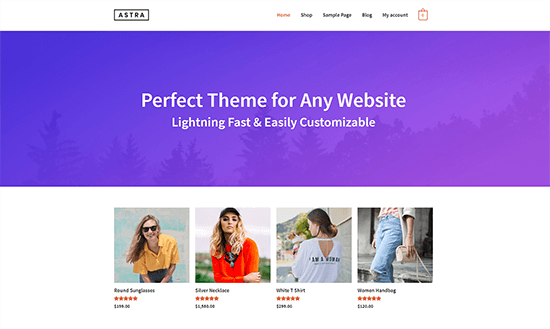 Astra is proving to be an extremely popular WordPress theme. Not only is it lightweight which is great for providing fast page load times, it’s also highly customizable when paired with its premium add-ons. Most WordPress themes are either lightweight or customizable – it’s difficult to have both. What I love is that the team behind Astra have provided a great lightweight theme that’s free, giving you the option to expand functionality with premium add-ons if you need more options. This means you only install what you need – no more unnecessary theme bloat! And what’s better is it supports most page builder plugins on the market. Price: Starts from $59 for unlimited websites. Free version with fewer features also available. Cook’d is a minimalist, food-focused theme with a lot of features. You get 3 homepage layout options and 5 post options with plenty of space for widgets. This theme also has a hero image area (a place for large headers or images to catch a visitor’s attention), and plenty of space in sidebars and footer areas to share more information about your recipes or business. This theme is perfect for food and drink bloggers that have image-rich content. Smart Passive Income has 3 homepage layouts and 8 widget areas. This theme can boost your business with tons of space for blog content and marketing leads. Sell your services in the customizable widget and sidebar areas to keep visitors on your site and convert them into customers. Typography is easy to read and customizable. This theme is perfect for high-converting content and bloggers that have multiple products and services. StudioPress does it again with Maker Pro, a third-party theme supported by JT Grauke. This theme is perfect for bloggers because of its flexibility and simple styling. It comes with multiple widget types, 3 layouts (full-width, sidebar left, sidebar right), and a customizable header area for your logo or brand name. Design your site with full-size imaging and polished typography. And wow your visitors with a fast-loading and mobile-responsive experience. 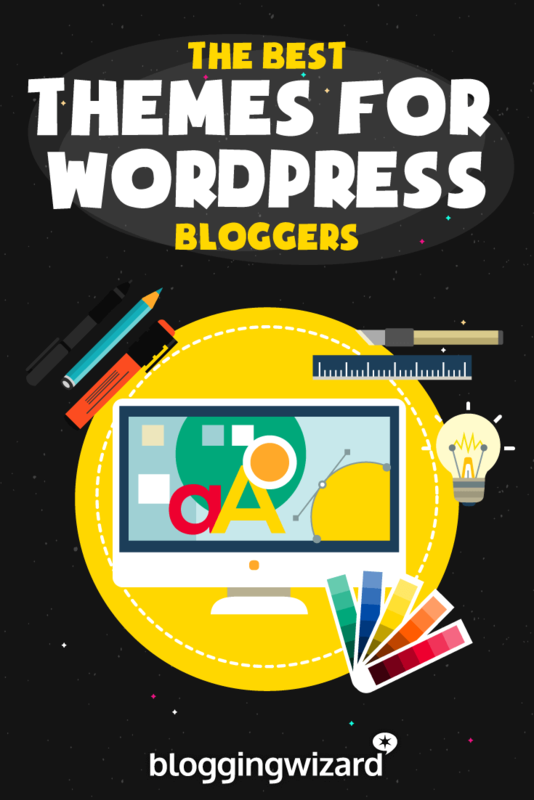 This theme is perfect for all kinds of bloggers. Whether it be photo, travel, food, stories, or design, the flexibility and large real estate of white space won’t detract from your content. Aspire Pro is one of StudioPress’ popular third-party themes. Designed and supported by Appfinite, this vivid and stylish theme is so flexible, every blogger would benefit from its customizable design. Fast, responsive, and secure right out of the box, Aspire Pro comes with 3 layout frames (sidebar left, sidebar right, full-width), and 4 flexible templates. Personalize archive, blog, column, portfolio, contact, and shop pages to your brand. And use the 15 widget areas and flexible homepage to grab your visitor’s attention right away. This theme is excellent for businesses and design portfolios. But can support all types of blogs. If you sell digital products, service-based or otherwise, StudioPress has you covered with Digital Pro. Convert visitors into customers by designing the homepage to take your readers seamlessly through the buying cycle. Inform them of your product, newsletter, or opt-in, and show them why they should buy into your service. You get 3 homepage layouts (sidebar left, sidebar right, full-width), and customizable colors to match your brand. There are three homepage widget areas to display advertising, contact information, business locations, and social connections. This fast, mobile responsive, modernistic design is superb for business blogs, personal portfolio, author sites, and any blogger who offers digital products. Evoke an emotion in your visitors with this image-rich theme. Use images and designs to create an atmosphere visitors will enjoy. Your site will be beautiful and limited only by your imagination. This simple yet bold theme comes with elegant typography and customizable pages to share your content. Whether it be visual or authored. You get one home page layout (full-width) and 4 homepage widgets to add social media, contact, or service information. Atmosphere has an abundance of white space, so it’s perfect for bloggers to showcase exciting content. Ideal for design, travel, food, and photo bloggers. Create your blog in a vertical design with this visually-stunning, parallax scrolling theme by StudioPress. Parallax Pro comes with 3 homepage layouts (sidebar left, sidebar right, full-width) and 5 homepage widget areas. Show your awesomeness vertically on one page. This makes it easier for visitors to get a feel for your work. Include pricing tables, origin story, call to action, connections, and more. This minimal theme comes in black and white with your choice of accent color (blue, green, orange, pink or red). Perfect for the modern blogger, Parallax makes it easy to convert visitors into fans. Showcase Pro by StudioPress is a contemporary third-party theme supported by JT Grauke. It comes with 3 layouts (sidebar left, sidebar right, full-width) and widget areas on the homepage and footer areas to display more information about you and your business. Color and background are entirely customizable with the built-in theme customizer. And the typography is a clean sans-serif font with the usual WordPress amenities (unordered/ordered lists, headlines, and button styles). This multipurpose theme is great for businesses that have a blog or bloggers who have a business. This is a great theme to showcase your work without having too many distractions. 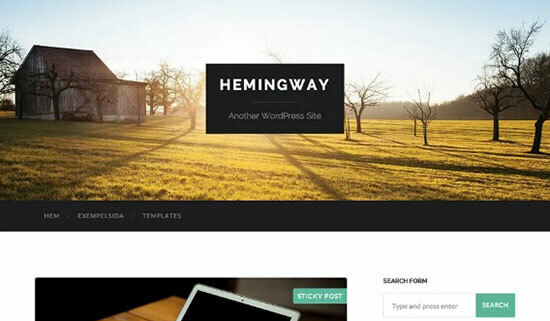 Here comes the ultimate WordPress theme that lets anyone create a website from scratch. No need for coding. Divi by Elegant Themes is truly exquisite and one of the most flexible theme you will ever use. You won’t get tied down with a set style, color or typography. Everything about Divi is customizable, from the way it looks, to the amount of pages and designs you can have. Drag, drop, type, color, design right on the page as you watch your site transform in real time. This theme is easy to design and control. If you’re looking for a paid theme that can grow with you and your blogging endeavors, Divi is the only one you’ll need. Perfect for…everybody. If you’re looking to make money from your blog, MoneyFlow by MyThemeShop is your answer. This theme makes it easy to monetize with its mobile responsive, translation-ready design. It comes with AdSense integration and Woo Commerce plugin support. Design this theme to match your brand with shortcodes, multiple styling options, unlimited coloring, and effective typography. No matter if you’re selling or blogging about digital, physical, or service-based products, MoneyFlow will support your business with a highly-customizable and affordable theme. Calling all fitness and health bloggers. Justfit by Mythemeshop is a modern-looking, highly customizable theme. You get unlimited colors, drag and drop simplicity, and AdSense and Woo Commerce optimization. Built into the theme are parallax and slider options, and you can personalize your site by using shortcodes, icons, and author boxes. There are also widget areas and social media buttons that can display more information. Whether you write about health and fitness, or sell physical or digital products, this theme has a lot of ways to customize. Justfit will be the perfect “fit” for your blog or business. If you’re into online marketing, or if you’re an online entrepreneur, Mythemeshop has you covered with SteadyIncome. This fresh-looking, responsive theme comes packed with a multitude of features that you can use to increase sign ups and convert visitors into customers. You get a partner logo slider, latest blog post area, built in subscription box, author info, and a social network widget just to name a few. Customization is easy with Mythemeshops unique options panel box where you can quickly make design changes. SteadyIncome has everything you need if you’re looking to secure a spot as an authoritative online marketer. Here comes a magazine-styled theme from MyThemeShop. This classic-looking but powerful theme was made for every blogger. Entrepreneurship comes with multiple layout and page templates, and the options panel (unique to all MyThemeShop themes) allows you to make quick and precise design changes. You also get social media integration and a host of shortcodes to further customize your blog. The best features are the compatibility with WP Review Pro, WP Subscribe Pro, and Mega Menu plugins. This theme is versatile and fully customizable so it can grow with your blog. This one is for all you foodie bloggers out there. WP Zoom, makers of high-quality, responsive WordPress themes, created this to be straightforward and clean. Choose from 6 feminine color styles (pink, dark, yellow, blue, dark green, light green). And use the slider or carousel capabilities to show your best images above the fold. Foodica also comes Woo Commerce capable, has special banner locations, multiple shortcodes, and a unique Instagram slider. You also get infinite scroll and live customizer. Whether you blog about food, wine, photography, crafts, or sell digital products, this smooth-looking theme will help you get noticed. Angle, by WPZoom, has a minimalistic, clean design and was created for bloggers who want to showcase their work on a simple but flexible space. It comes with a built-in portfolio module to display your work, dynamic WPZoom widgets to customize your homepage, and unlimited color and typography. That way you can match the site to your brand. It also has clean typography and substantial whitespace. Lots of areas to display information, social buttons, an Instagram listing, and more. If you are a business blogger, this simple design will represent your work in the best way possible. This is an elegant, classic-looking theme from Themeforest. It’s made for the Redux WordPress framework and designed for bloggers looking for something to display content in a visually appealing fashion. It comes with a main slider or carousel front page, Google fonts, custom widgets, tons of shortcode, and a sticky header. You can choose the type of post you want to use (standard, video, audio, gallery, or link). And include your logo in the sticky menu and footer areas. Make an impression with beautiful imaging and chic typography. Reading will help you stand out from other blogs. Litera from the Themeforest gallery is another elegant-looking theme for personal bloggers. Reminiscent of a Medium-styled theme, Litera has a lot of white space and unlimited color choices. It’s also plugin ready for Yoast SEO, W3 Total Cache, and Contact Form 7 plugins. Choose from 5 unique layouts (small slider + columns, large images, one column, one column + slider small posts, and one column large posts). You can create an uncluttered reading space and put extra information in the footer section so it doesn’t get in the way of your content. Litera is beautiful and responsive, perfect for any personal blogger looking to convert readers into avid followers. If you’re looking for a theme that is simple and allows your visitors to focus only on reading your content, then Writing is your theme. From the Themeforest gallery, Writing is the most simplistic, easy-to-read theme for your personal blog. A simple sidebar can display social, contact and more stays hidden until a visitor clicks on the menu icon. And a clean menu gives simple directions to your content. It comes with the usual display features (default, classic, list, and masonry), and customizable color and typography. This theme is perfect for all bloggers who want a clean-looking and easy to manage website. If you’re about ready to throw the “minimalist” movement out the window, Noemi is here to support your creative yearning. Straight from the Themeforest gallery comes this fashionable and modern theme. It comes with 10 + layouts (classic, visual left, and visual right just to name 3), customizable font and colors, and a sticky menu bar so visitors can quickly move to more content. 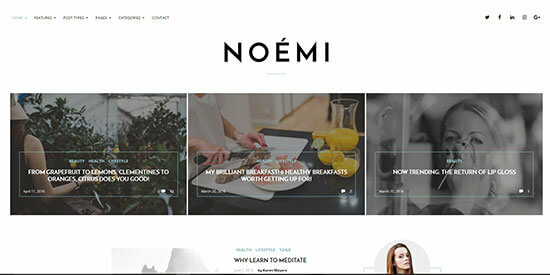 Noemi also comes with multiple post layouts, 3 header options, and 2 footer options to display social and content information. Forget minimalist and get creative with Noemi, it plays perfectly with your unique style and ingenuity. Perfect for design and lifestyle bloggers. Redwood is not so in-your-face beautiful like Noemi, but it does have a modern and clean look that’s perfect for lifestyle, photo, and travel bloggers. This theme comes with 5 blog layouts (classic, grid, full-post/grid, list, and full-post/list), and 4 post formats (standard, video, gallery, and music). Customize your widgets to display social links, about-me blurbs, contact information, recent posts, and more. Color and typography are unlimited, and you can design your slider and promo boxes to fit your brand. The best part about this theme is the Instagram feed footer that links to your account. This modern-looking theme is perfect for creative lifestyle and travel bloggers. The Blogger, from the Themeforest gallery, is a highly customizable theme that can take on any form you need. There are 12 demo versions so you can see all the ways you can design. Color and font are unlimited, choose from 4 header layouts and dark versions of the theme. And the “featured” area is where you can post your best content. The live customizer makes it easy to design and go. Choose from various post and blog layouts and use the custom widgets for Flickr, Instagram, and Pinterest. This theme is black, white, modern and gorgeous. Perfect for any style of blogger. We didn’t forget about all you social-centered bloggers who cover news and what’s trending now. BoomBox from the Themeforest showcase has your winning ticket. This has a viral magazine-style vibe. It’s all purpose and ready for you to set your listicles, news, polls, and quizzes. Complete with voting systems, reaction emoji, and trending links. Visit the 9 different demos that show how customizable this theme is. Use features like paginated posts, polls, personality quizzes, and more. This bright and bold theme is perfect for social-centered and monetized blogs who are striving to go viral. Vloggers rejoice. This theme from the Themeforest studio is the most customizable and flexible WordPress theme to exhibit your work through video, image, and blog posts. This theme is compatible with YouTube, Vimeo, Dailymotion and other video platforms. You also get multiple post layout combinations and flexible image sizing. Vlog is optimized and ready for monetization. There are multiple header layouts, sidebars, and widget areas that make it easy to place other content like social buttons and product information. Vlog is flexible for any video blogger whether you’re looking for minimalistic or bold, default or colorful. This theme has everything you need to house your video posts. Here’s a magazine-style WordPress theme from the Themeforest studio. Urban is mobile responsive and visually stunning, ready to display any topic or niche you dabble in. It has 7 unique homepage layouts, 3 style headers with light and dark versions, and 3 mega menu styles to offer more options to visitors. Your content will be community driven as followers can rate and vote on content. You even get a ticker-style slider bar above the fold that displays trending content. If you’re looking to create an authentic online magazine vibe, Urban is the theme that can get it done for you. Candor from the Themeforest gallery is designed for entrepreneurs that also have a personal blog. 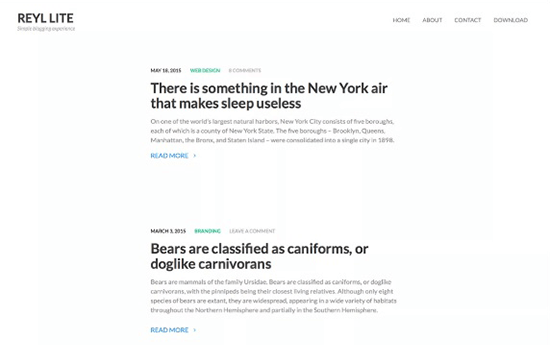 Clean and minimal, Candor has an easy-to-use layout with a lot of space. But it doesn’t come with a lot of features that can distract from your beautiful content. You get 2 post layouts (full-width and sidebar right), and a multitude of widgets to display author bio, recent posts, top posts, and recent tweets. There’s also an Instagram feed carousel that you can put at the bottom of your pages to increase visitor interaction. 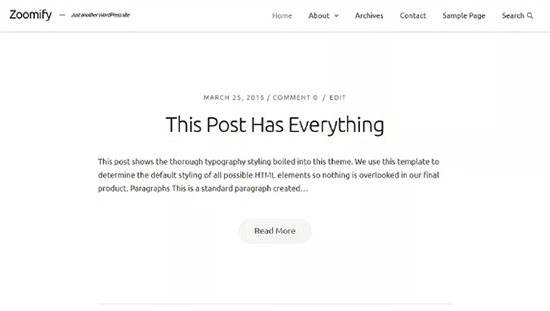 Simple and clean, this theme is best for content writers looking for a clean design without a lot of distractions. Lee is another simple theme from the Themeforest studio. But where Candor’s design is focused more on reader engagement, Lee focuses more on social sharing and conversion. Still simple and easy-to-use, Lee comes with 5 custom widgets, 13 sidebars, Google fonts, and is SEO and translation ready. You can choose to display your content in a variety of views, and the ever-present menu bar allows visitors to move quickly to other content. This theme is also social network friendly and comes with Instagram integration. Lee has a contemporary look and has just the right amount of fluff if you’re not ready to go super simplistic. The Reader is a bold magazine-style theme made for the Redux framework and comes from the Themeforest studio. This theme was designed after the popular layout of Smashing Magazine. You get 4 header styles, 5 homepage options, and 2 footer and header styles. The overall look offers sidebar left and right, sidebar right, and two column with sidebar right. It’s unique and has lots of customization options and space for all your content. This theme was made for web developers, designers, and magazine blogs looking to attract, convert, and monetize. Talk about saving the best for last (of the paid themes). X The Theme from Themeforest is amazingly flexible. X integrates with extensions like ACF Pro, Superfly, Uber Menu, Mailchimp, Video Lock, Revolution Slider, and much more. This theme’s futuristic look features your best image above the fold and the menu bar sits just at the bottom of the fold. Once a visitor starts scrolling, that menu bar remains as a sticky header at the top of the page. Whether you’re a minimalist blogger, web designer, or content marketer, this theme has a design template you’ll love. Don’t be fooled by “free.” These themes can be just as powerful as premium themes. Ideal for bloggers just starting out or seasoned bloggers looking for something simpler. You don’t have to sacrifice design, style, and responsiveness with a free theme. 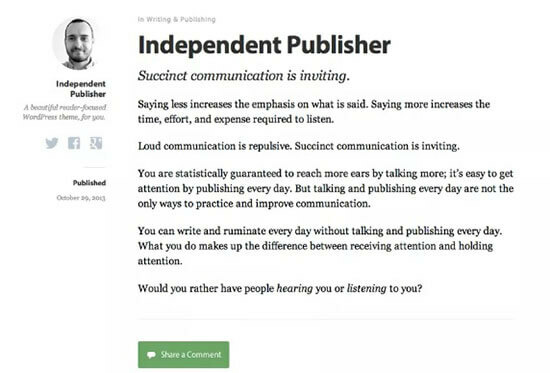 First up from the free section of WordPress.org themes is Independent Publisher. A minimalist, story-focused theme. You get all the things you’d expect from WordPress. Customize your backgrounds, color, and typography, add images and widgets to the sidebar to show more of your content. The ever-present sidebar can sit to the left or right of your content. And you can have the author picture and bio sitting at the top of the sidebar, or you can add a logo if your blog has multiple authors. This responsive theme is easy to use and simple. Perfect for the budget blogger to share stories and ideas on. Reyl Lite is the most minimalistic theme out of this list of WordPress.org themes. Responsive, SEO optimized, and translation ready, you can customize color, font, logo, background, and header to match your brand. This single column layout has no sidebars to get in the way of your content, and the menu/logo sits at the top left corner. Keenly minimalistic, Reyl is perfect for personal blogs, portfolios, and anyone looking for a simple and affordable way to get their work online. This affordable business theme from the WordPress.org gallery is for bloggers looking to project a professional online presence. Sydney is highly customizable. You get full-color control, access to Google Fonts, and a customizable background and page layout. You also have the ability to create a hero page with parallax scrolling effect above the fold, or add a full-screen slider to invite visitors to learn more about your work. The sticky header and return-to-top button make navigation easy. This theme is impressive and will serve small businesses and personal bloggers well. You get a full-width header image with a menu that sits just beneath that image, and you can add a parallax scrolling effect above the fold. Customize this theme to your favorite colors, add a logo, and manage your footer widgets and page templates. This theme is tagged for right-sidebar and full-width layouts. Hemingway is perfect for the personal blogger or journalist. This WordPress.org gallery theme is the most stylish of the free minimalistic WP themes in this list. However, its last update was on 8/31/15. But don’t let that stop you from looking over this highly-rated theme. It comes with a sticky header and single-column layout without sidebar. That way nothing can detract from your content. You also get all the customizations available in a WordPress theme such as color, font, and layout. There is also a footer widget where you can add social or contact information. This theme is perfect for personal bloggers looking for a more stylish but affordable and simple theme. No matter what kind of blog you have, get a WordPress theme that best showcases your style and hard work. You put a lot of effort into creating content, whether it be video blogs, travel or photography content, or stuff you want to go viral, there’s a theme from this list to support your online musings.